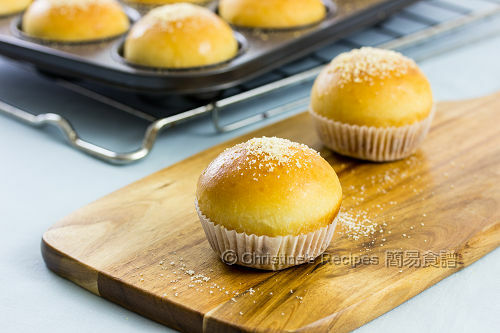 These cheese and bacon buns are so fragrant and perfect for breakfast or snack. The dough was proofed at low temperature in fridge in order to bring up more aroma from the flour. The cheese I used was smoked. On top of all buns were sprinkled with cheese powder. Who can resist these soft, super fragrant buns? None of us in the family can. So, the minute when these buns came out from the oven, two were gone in a minute literally. 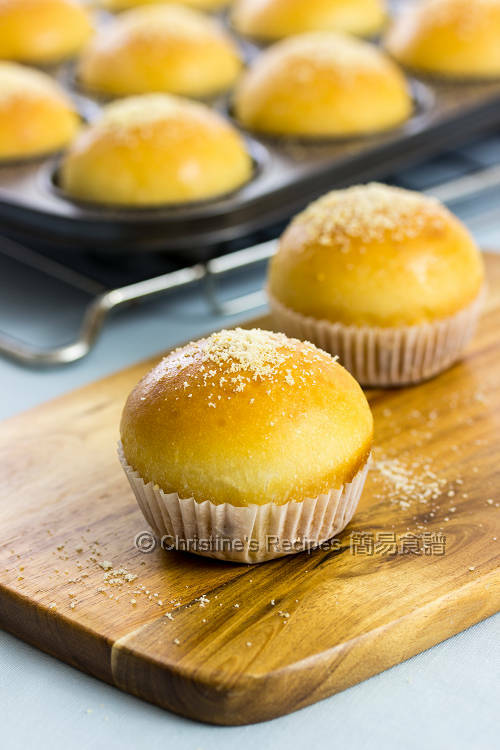 For those who like using tangzhong (water roux), you might try this cheese and bacon bread. Mix all ingredients (except butter) in a breadmaker, by adding the wet ingredients followed by the dry ingredients. Or you can knead by hand. When all the ingredients just come together, knead in butter until the dough passes the thin membrane test. (The dough could be stretched to a thin membrane, as shown in the above picture). Let the dough proof until doubled in size. Deflate the dough and knead into a ball shape. Place it in a plastic container or plastic bag. Refrigerate for about 12 to 16 hours. 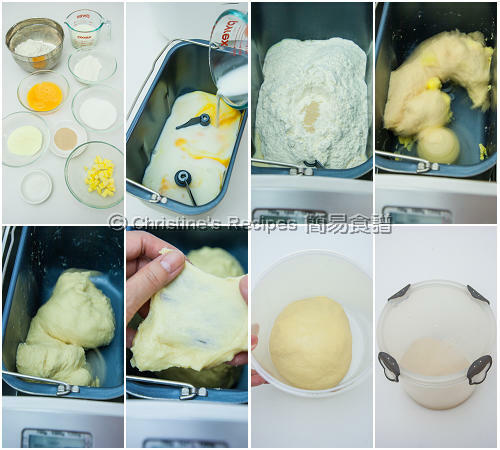 Remove the dough from fridge. Deflate it and divide into 12 equal portions. Roll each into a ball shape. Cover with a plastic film. Set aside for 15 minutes. Roll each portion into a 7cm dough disc. Wrap a full heaped teaspoon of cheese and a full heaped teaspoon of bacon inside. Put it in a hole of muffin tray. Finish wrapping the remaining dough portions and fillings. Cover with plastic film and let them proof until doubled in size, about 1 hour. About 5 to 10 minutes towards the end of proofing time, preheat oven to 170C/ 335F. Brush the surface of each dough with whisked egg. Bake in preheated oven for about 15 to 20 minutes. Remove the buns from the oven. Sprinkle cheese powder on top. Turn them out from the tray onto a wire rack. Serve warm. The leftovers can be kept in an air-tight plastic bag or container. Smoked cheddar cheese is available at supermarkets. Or you might use any kind of cheese you like. I like to sauté the bacon first to bring up more fragrance and render/skim the fat. This dough is quite wet and sticky at the beginning. It needs more effort and patience if you knead by hand. That's why I used my breadmaker. For your case, you can simply skip the egg when making the dough. Try to add a bit of water or milk to adjust the dough texture as you go. These would make a great dinner with either a bowl of cold soup or a green salad....they look super, Christine. Hi christine, can we skip the fridge step? What will happen if we do? You can skip the chilling step. The slow proofing process in the fridge will bring up the fragrance of the flour. These buns are so adorable and they look delectable! I absolutely adore the bacon inside! I tried your cheese and bacon bread. It taste amazing. Two thumbs up. I would like to try the bun version. Can I substitute cake flour with multipurpose flour? And I don't include tangzhong in this recipe rite.Thank you. Sure, you can use all purpose flour instead if you don't mind the texture will be slightly different. No need to add tangzhong. The water content in this recipe is quite high already. I think I've tried almost all of your bread and cake recipes with wonderful results! Thank you for posting such great recipes. 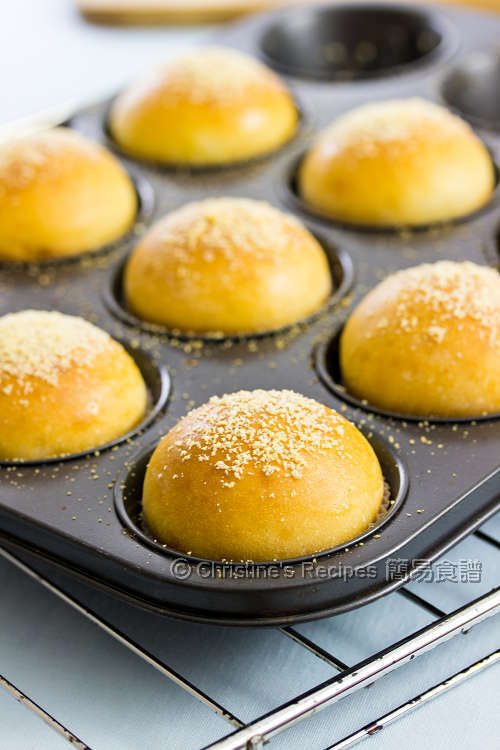 I do have a question though in general about baking bread buns on a cookie sheet instead of in a muffin tin. Sometimes during the 2nd proofing, the dough spreads outwards so it becomes flatten instead of looking tall and round like the ones in your picture. Would you happen to know what I can do to fix this problem? Thank you! I also encountered the same problem as you shared here. If the dough is soft and light, it tends to spread and flatten a bit during the 2nd round of proofing. So, a muffin tin or a large cake liner will help your bread proof nice and tall. Hi Christine, how do I replace milk powder? Thanks. The milk powder is to enhance the fragrance. You can skip it if you don't have any. Of course, you can use any cheese you like. Hi Christine. I love your recipes! Is the 12-16 hours in fridge absolutely necessary! And if so is it ok if it's left longer like 24 hours? But letting the dough proof in low temperature will give more flavours. You might like to bake it straight away after 2nd proofing. Over-proofed dough will develop a smell of alcohol. I often use Defiance, White Baker's Flour, available at Coles. This bacon and cheese buns were made with this brand. I dont hv a bread maker can i use kitchen aid wit d hook? Sure, the kitchenAid with dough hook can do it. Hi Christine, my breadmaker's instruction is to add the butter as dry ingredient before kneading. Your recipes however call for butter to be added after the dough had been kneaded, will there be any difference? Thanks! If butter, or any oil, is added at the beginning, it coats the protein fragments as a result that stronger gluten is difficult to be formed. If you want soft and fluffy bread, you need to wait all ingredients come together before adding butter. If you want to make a tight-crumbed bread like a pound cake, then add butter at the beginning. Which function shall I use to do the dough with my breadmaker? Jz the normal basic dough is good enough? I often use the "dough" function that includes kneading and proofing. Think that your breadmachine is more or less the same. That'll be good enough. Remember to test your dough if it passes the window-pane test. Jz another question. Can I substitute cake flour with plain or self raising flour? You can't replace with self raising flour as it's added with a raising agent already. But you can use plain flour instead. The texture of the end result will be different, not as soft as mine. Btw, can I use active yeast instead of instant dry yeast? You can use active dry yeast. For making this recipe, you need about 6.25 grams of active dry yeast. Let it proof in warm water (not above 40C, a small amount taken out from the recipe) dissolved with a bit of sugar for 10 minutes. Having seen some bubbles arise, mix it with other ingredients. I would like to thank you for teaching me how to bake bread. I have started baking bread following your blog a month ago and enjoyed it totally. Can I use soya bean milk instead of milk for this recipe? Sure, you can use soya bean milk instead. Same amount. Hi Christine, can I substitute cake flour with superfine flour? Cake flour is low protein flour. Is your superfine flour low in protein content? Glad that your family loves these buns. 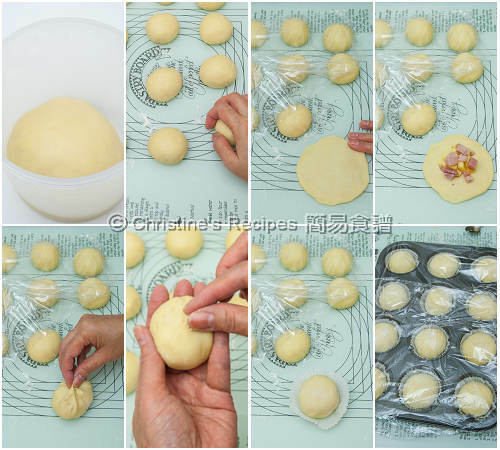 For the bacon & cheese one, tangzhong is added so the dough is quite sticky to your hands. That's why I often use my bread machine to help knead the dough. Did you test your dough? It should pass the window-pane test. Otherwise, it'll still be very sticky after proofing. Hi Christine, may I know what shall we do if the window pane test is not passed? Do we need to continue kneading it? Thanks! If the dough doesn't pass the window pane test, that means not enough gluten is generated inside. You can keep kneading until it passes the test or close to the passing point. No worries. If your dough doesn't pass the test, you can still bake it. The buns may not be soft as you expected though. They still taste good. It's no harm. How much of tangzhong to add dear Christine? Sorry am new to baking. Tq. This recipe doesn't need any tangzhong at all. The ingredients are listed in the recipe. Simply combine and knead them into a dough. Sure, you can knead the dough by hand, then bake it in an oven. Thanks for the recipe. Doesn't the dough become dry when refrigerated for such a long time ? The dough should be kept in a large air-tight container. Then it won't be air-dried in the fridge. Can I use water instead of milk? Can the bread keep soft for many days? Is this bread recipe similar to the butter bun recipe? I am looking for a basic bread recipe that can make loaf bread and otah bun. Tks. No problem. You can use water instead. The milk is to enhance the fragrance of the bread. This bread is not made with tangzhong so it won't be kept soft as many days as tangzhong breads. Just like other regular bread. If you store them in an air-tight container, they'll be kept longer. Can i replace bread flour with whole wheat high protein flour instead? Thank you. You can if you like. The texture of the end product wouldn't be like mine anyway. Hi Christine, do you know where I can get bread flour and cake flour in Australia? I can't seem to find it anywhere. Thanks. I got bread flour from Coles, and cake flour from Asian grocers. Have you checked the texture of your dough before popping it in your oven? Normally speaking, you can tell how the loaf will be like before baking? If the dough is kneaded and passed the window-pane test, proofed properly, you have higher chance of getting a nice-rising tangzhong bread. My dough rose while in bread maker but had a flat top. When I tip the dough out it was very wet and almost runny. I had to add extra flour and yeast and mix it again to firm it up. If your dough was very wet and almost runny, many possible causes might've happened. It could be the yeast died, or the dough was over-heated, or over-kneaded or the measurement was wrong etc. You're the only person who can think through what went wrong in the process.